Season diced, cooked chicken with 1/2 teaspoon kosher salt. 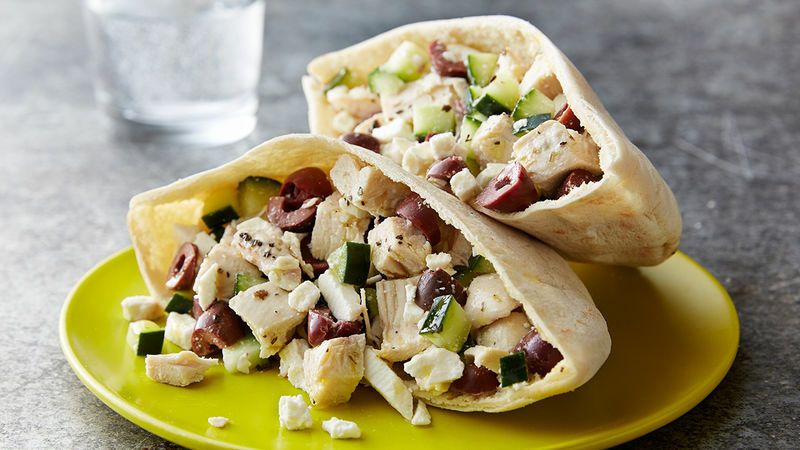 In a large bowl, combine chicken with diced cucumber, crumbled feta cheese and chopped olives. Set aside. In a small bowl, combine olive oil, white wine vinegar, dried basil, and salt and pepper to make dressing. Add dressing to chicken salad mixture and toss to coat. Cut pita pockets in half and fill with chicken salad. Yields two pita halves per serving. When I think of "chicken salad sandwiches" my first reaction isn't so positive. Honestly, I am not a big fan of mayo. And frankly, I avoid chicken salad like the Wicked Witch of the East avoids water. Everyone has their dislikes right? But then I remembered a fabulous salad sandwich that I ate years ago. Served in a warm, soft pita, the salad included olives, cucumbers, feta and more with a not-too-tangy, but totally delish vinaigrette. The more I thought about it, the more I lusted after a similar chicken salad made with cubes of chicken. After all, who said that chicken salad absolutely, positively has to have a mayo-based dressing? No one! So, I set to work to create a mayo-free version that is totally crave-worthy. My Greek Chicken Salad Sandwich is the resulting recipe. I love how the crunchy (and a little salty!) bits of cucumber interact with the briny olives, moist chicken and crumbly feta. You just have to try it. For the chicken, I cubed up some leftover grilled chicken from the previous night's dinner, but you could also use rotisserie chicken. Keep all the cubes to the bite-size level so that it's easy to bite into. It's great in a pita, but could be eaten on a bed of lettuce too.